The ATTO ThunderLink® NS 3102 acts as an external Thunderbolt 3 to dual 10GbE adapter, connecting Thunderbolt enabled systems (all-in-ones, workbooks, mobile workstations) to 10Gb/s Ethernet networks and storage devices. When faced with the challenge of architecting solutions that allow guaranteed delivery and easy deployment into your workflow ATTO ThunderLink's provide a purpose built solution. With 10Gb/s data transfer rates, Ethernet ThunderLinks are the connectivity choice for bandwidth-intensive applications such as data back-up and restoration, clustered computing, IP content delivery, medical imaging, and video rendering. Now, the time tested combination of ATTO and 10GbE is being integrated with the latest in cutting edge high performance Thunderbolt 3 connectivity. 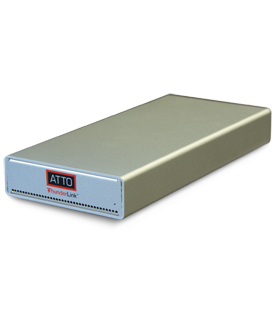 ATTO 10GbE devices provide the most flexible and scalable connectivity for today's high bandwidth content creation environments. 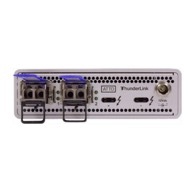 ThunderLink 10GbE devices offer driver support for Windows® 7 and later, and macOS® Sierra and later, providing a single connectivity solution for customers with heterogeneous operating system environments. Growing adoption of 10 Gigabit Ethernet combined with increased bandwidth of Thunderbolt 3 delivers much-needed performance benefits to bandwidth intensive applications. With high data transfer rates and multiple offloads (TCP, IPv4, UDP), ATTO Ethernet ThunderLinks are the premier connectivity choice for bandwidth-intensive applications such as data back-up and restoration, IP content delivery, medical imaging, and video rendering. With multi-core processors driving the need for 10GbE, ThunderLink delivers superior throughput to meet the need. ThunderLink 10GbE devices provide a common foundation for both local and storage networks. The ThunderLink NS 3102 leverages standard OS management and monitoring tools to dramatically reduce the cost and complexity of a data center's administrations and infrastructure. Watchdog Timer for chip/driver status monitoring.